Hooray! It’s on! Your friends just got engaged! Now you need just the perfect little present to let them know just how psyched you are by giving them a thoughtful engagement gift. We’ve found over 70 ideas! 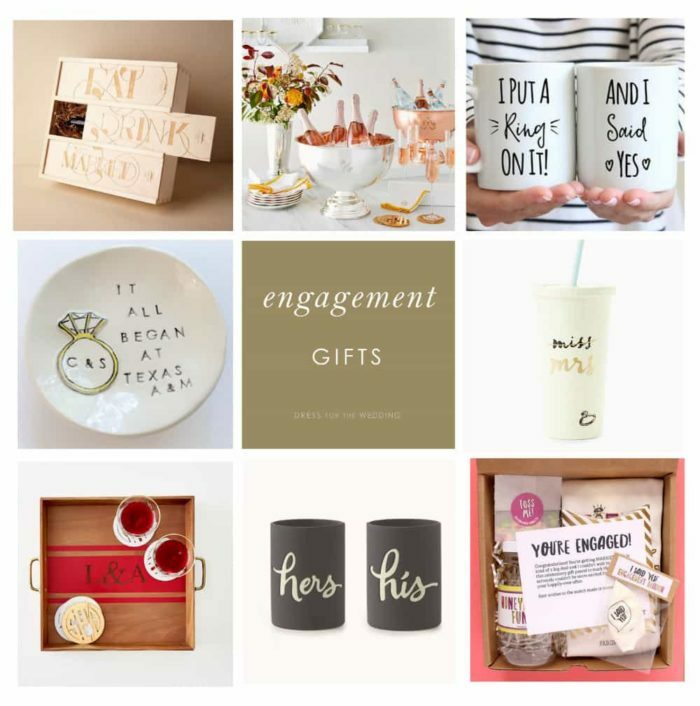 The fall and holiday season is prime time for engagements, so to help you find some great ideas for gifts to gave your newly-engaged friends, we’ve collected these ideas in shoppable format! I love picking out gifts for people, so I’ve created this little collection of engagement gifts that are just perfect for happy couples. Whether you give these as a stand-alone gift, or make a box of of goodies for your favorite engaged couple, these ideas are here to help! Still Searching for Just the Right Engagement Gift? Sugarfina – yummy and beautiful treats, including my favorite, gummy Champagne Bubbles! kate spade new york – so many cute ways to stylishly show off your new status! Amazon – as usual, everything you can think of! Pick up some bling wipes, this wedding planning checklist, and some other goodies! Check out this post for more gift ideas! And now you have a wedding to get dressed up for, so don’t forget to stop back here for all sorts of wedding attire ideas! Also check out Bridesmaid Gifts, and our Holiday Gift Guide! All shop sections use links from our retail partners.